The date of the performance is appropriate. This is a Christmas Fairy Tale with roles for the Christ Child, Father Christmas, an Old Fir tree, Christmas Elf, lots of Children and a Chorus of Angels. It�s certainly a very long way from Palestrina. The overture is an extended one � nearly eleven minutes � for a work lasting not much more than ninety-six minutes of which only just over seventy consists of actual music. Still, it�s a piquant and enticing overture � lots of pipy and active wind writing, a more serious central section and an affectionate simplicity. Pfitzner once recorded it and Mahler conducted it. The influences are there though � Tristan but also the lighter Wagner, and certainly some Smetana touches; Ma Vlast and the overture and orchestral music of The Bartered Bride. In the purely orchestral sections of No.6 we can hear a debt to Schubert�s orchestration and to Dvoř�k. There are one or two Straussisms as well and the prevailing ethos throughout owes a huge debt to Humperdinck�s Hansel and Gretel. �The ensuing music has its fair share of folksy touches, though there�s plenty of Bohemian and German forestry and sap in the wind writing throughout. There are a few disconcerting associations such as No.4 Du holdes Puppengesicht, which reminds me of Mendelssohn�s I�m A Roamer. There�s a deliberate quotation in No.5 Nun woll�n wir einmal seh�n of Tenenbaum. Elsewhere we hear some real angelic piety and some bluffly avuncular lines for Father Christmas. The violin writing in Act II for the children is really luminous in its clarity and sensitivity. Pfitzner varies the textures in the Melodram of Act II by having the narrator speak over music, an effective touch. 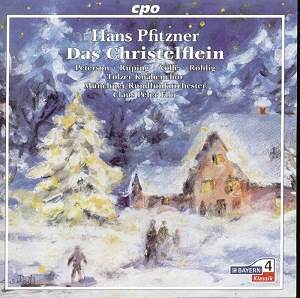 The longest and most complex section is No.12 Bei wem das Christkindchen where there are some coloratura demands such as are not present elsewhere. The singers are all excellent. Marlis Petersen bears the greatest weight and she proves effortlessly in command of Pfitzner�s requirements, from the more Elysian moments to the greater strenuous demands of the second Act. She�s a soprano to watch without question. The contrast between her soprano and that of the Christ Child Martina R�ping is dramatically convincing whilst Kevin Connors and Christian Bauer are highly effective tenors. Michael Volle is avuncular and well focused. The boys� choir and orchestra are smartly and sensitively handled by Flor who directs the whole performance with commendable sensitivity - and no indication that he finds any of it sentimental slush. The drawback is that no English translations are provided so your German had better be up to snuff or you�re in trouble. The recorded sound, live as I indicated, is first class and the booklet notes go into great detail about the work�s possible Nationalistic-racial implications. I think we can safely ignore those murky waters and listen to it for what it is. It�s certainly unlike any Pfitzner I�ve ever heard and nor have I heard the competition from 1979 on Orfeo directed by Eichhorn.